Under the boardwalk, we’ll be having some fun. Under the boardwalk, people walking above. Under the boardwalk, we’ll be falling love. Perhaps no locale better embodies the ideal Americana vacation of yore like the boardwalk. Tourists from landlocked areas would flock to these waterfront areas. Here, they would spend their days on the beach, luxuriating in the sensation of sand between their toes. They’d also have access to shops and restaurants centrally located to appeal to visitors from other areas. Yes, everyone of a certain age grew up loving the boardwalk, Disney executives included. Here’s a guide to Boardwalk Villas, the Disney Vacation Club (DVC) hotel that celebrates a formerly great kind of summer getaway. From the early days of the Disney Decade, corporate executives planned a boardwalk-inspired resort. Then-CEO Michael Eisner had to delay those plans for an unusual reason. The explanatory headline in the Orlando Sentinel in 1992 stated, “Disney Decade Revamped By Recession, Gulf War.” It anecdotally referenced that “an 82-acre speciality [sic] retail and entertainment complex” was awaiting a construction date. As longtime DVC members know, people had to wait a long while for the new shopping district. The official opening of the Boardwalk occurred on July 1, 1996. During those four years of delays, park planners scaled back the plans slightly. The current Boardwalk resort complex is only 45 acres, but it still achieved Disney’s primary goal for the space. It’s a wonderful entertainment complex full of shopping and restaurants. And the resort features an impeccable theme. The theme of this resort is classic American boardwalk tourist area. When you think of Atlantic City, you’re recalling the first popular 19th century boardwalk, the one that became the inspiration for others. It’s also the source of homage at Boardwalk Villas. The hotel takes the premise of the glory days of the Atlantic City boardwalk and reimagines them for Disney fans. 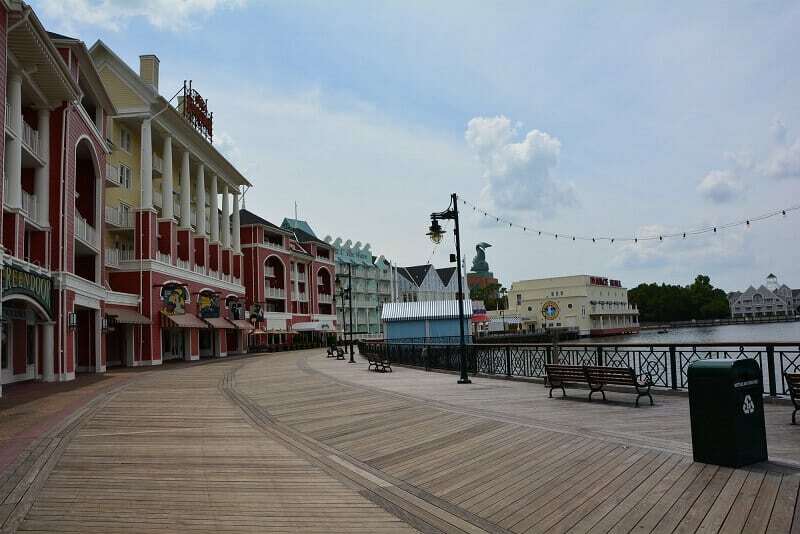 You’ll see the classic boardwalk promenade here, a walking area that’s ideal for shopping and dining. You’ll also feel like you’re near the ocean thanks to the view of Crescent Lake, the waterway that leads to the back of Epcot’s World Showcase area. It’s a visually stimulating kind of architectural design, a throwback to a simpler time when families would make annual summer vacation treks to the boardwalk. The hotel lobby accentuates the premise of the boardwalk of days gone by. You’ll see numerous paintings and works of art that celebrate this culture. Some images show the earliest known boardwalk roller coasters and other elements from these tourist areas. You’ll see a famous carousel on display here. You’ll even get to look at a Clamshell Mutascape, an old-timey kind of movie display. Think of a giant stand with a Viewmaster inside. It’s the perfect touch to reinforce the notion that you’ve traveled back in time to 1940s era Atlantic City. A night’s stay at the Boardwalk is equal parts inexpensive and convenient. I’ll discuss the convenience factor in the Hotel Amenities section. The inexpensive part references the beneficial points chart at Boardwalk. For more than a third of the year, guests can spend a week at Boardwalk Villas for 76-78 points. That’s 30 points cheaper (!) than the resort across the water, Disney’s Beach Club Villas. In other words, the points cost about 38 percent less at Boardwalk during Adventure Season and Choice Season. For those points, you get to stay in a 359-square foot studio with a decent floorplan. Were the entry way a bit larger, the studios at Boardwalk would be two squares, the living room section and the kitchenette/bathroom/closet section. Everything from the entryway to the balcony is basically a straight line, with the bathroom on one side and the kitchenette on the other. In the living space, the main bed and sofa/sitting area are on one side while the pull-down bed is opposite them. Studios do get more expensive when you want a view. The booking classes are Preferred View and Boardwalk View. When you pay for Preferred View, your room should look out on the gardens or pool area, although some folks have reported lake views, too. The Boardwalk View is self-explanatory and heavily in demand. From your room, you can see all of the action on the Boardwalk. These studios are wonderful for people-watching, and they also feature a breathtaking view of the water. The only downside of these rooms is that some DVC members consider them loud, which makes sense given the hubbub below. At Boardwalk, you’ll have a choice of three different levels of bedroom villas. The one-bedroom costs as little as 20 points nightly, which is better than some monorail resort studios! On weekend nights, the points cost is more in line with other resorts. The cheapest nightly charge is 27 points during Adventure Season or 28 points during Choice Season. You’ll again pay more for Preferred View or Boardwalk View. During Adventure Season, the point charges are 28 for Sunday-Thursday and 31 for Friday/Saturday. In Choice season, it’s 29 points on weekdays and 34 points on weekends. When you own at Boardwalk, a decision that you should make early is whether you think the better views are worth the additional points cost. The downside of all one-bedroom villas is that they’re only 712 square feet, which means they’re the same size as a studio apartment in most cities. The two-bedroom villas are quite a bit more spacious. They’re 1,236 square feet and have an efficient floor plan. Since these rooms only cost 10-15 more points per night than one-bedroom villas, you may prefer them. Carefully study the point cost and your traveling party’s needs when deciding. If you have a large group, the Grand Villa is an expensive but luxurious option. It sleeps a dozen across 2,470 square feet. A single night’s stay in one of these starts at 77 points and goes as high as 145 points, so this option isn’t for everyone. Distinguishing the Boardwalk Villas from the Boardwalk itself isn’t easy. One is only a few steps away from the other, and so most DVC members deem them a combo package. For the moment, let’s stick with hotel-specific amenities. The resort pool at Boardwalk Villas is kind of infamous in DVC circles. It’s the clown pool that will either remind you of the circus or the scariest parts of the movie, It. When you order fast food, you speak into the clown’s mouth. At this hotel, when you ride the waterslide, you exit through the clown’s mouth. It’s all great fun unless you suffer from coulrophobia, an irrational fear of clowns. Otherwise, the pool area here is lovely and quite serene. Of course, the BEST amenity at Boardwalk Villas is its location. It is a short walk down the Boardwalk and a crossed bridge away from the back entrance to the World Showcase. Fans of Epcot exhibitions like the Epcot International Food & Wine Festival loooooove the resort for this reason. For 10 points per weeknight, guests can stay here and then spend all day eating and drinking at the World Showcase. Boardwalk Villas has an underappreciated flip side to its easy Epcot access. It also features a special walking trail that leads to Disney’s Hollywood Studios. Until the arrival of the Disney Skyliner, this resort remains the best place to stay when heading to that park. It has ferry boats that take people straight to the International Gateway at Epcot and the boat dock at Hollywood Studios, too. As such, its logistics are terrific for half of Walt Disney World’s parks. You can walk to the front of Epcot and take the monorail straight to Magic Kingdom, also! The other hotel amenities generally involve the Boardwalk itself. Yes, the hotel has room service and movies under the stars, but the restaurants and stores on the strip are where you’ll do most of your shopping and eating. Restaurants like Trattoria al Forno, ESPN Club, and Flying Fish serve delicious food, while AbracadaBar is the bar of choice for hotel guests. The brilliance of the resort’s setup is that you get the entirety of the Boardwalk as a bonus with your nightly stay. As far as infrastructure goes, this amenity is hard to beat. In reading the above, you’ve likely determined the pros and cons already. For guests who plan to spend most of their Disney vacation at Epcot and Hollywood Studios, BoardWalk Villas is a wonderful option. It also costs fewer points than Disney’s Beach Club Villas, which resides across the lake. You’ll learn precisely how much you value Stormalong Bay when you compare the point charts for the two resorts. They’re otherwise similar in terms of amenities, although Beach Club’s restaurants are inside the hotel. Beyond the short trips to the parks and convenient Boardwalk access, the resort’s best feature is its points cost. Longtime DVC members know how to maximize their stays during Food & Wine and other festivals. A Sunday-Thursday trip during September or October costs only 50 points, a stunning value. The flipside of this situation is that the rooms book extremely early, meaning that you’ll want to own at Boardwalk if you plan to stay there during exhibitions. Fans of Magic Kingdom won’t have great options at Boardwalk Villas. You’ll either rely on the bus system or walk from the back of Epcot all the way past the front gates to reach the monorail. That’s a mile and a half of exercise that you may not want before a Magic Kingdom park day. The other con that I hear a lot about Boardwalk Villas is the lack of a restaurant onsite, but I find that criticism silly. The Boardwalk has several great places to eat, and it sits right beside the hotel. What some people list as a con is one of the hotel’s strongest pros for me. Your mileage may vary. In terms of the hotel, Boardwalk Villas is toward the bottom of resorts in terms of theming, at least to me. Don’t get me wrong. It’s wonderful. All DVC properties are. It’s just that DVC resorts are like Pixar movies. The competition to be the best is fierce. At Boardwalk Villas, the rooms and the hotel amenities don’t stand out for me. It’s the location and proximity to two theme parks that matter most. And the generous points chart is the special boost that makes this resort a strong consideration for your next contract. Access all DVC resale listings and learn more about buying and selling with DVC Resale Market.